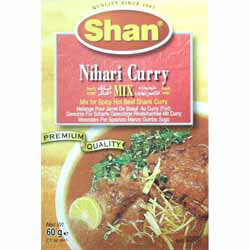 • In a large pot, heat half the oil, add the meat and Shan Nihari Mix. Fry until the oil separates from the masala. • Add 3½ litres wataer and the bones. Stir and bring to boil. Cover and cook on a very low heat until the meat is tender. (For beef 6-8 hours, for mutton 4-6 hours). • Remove the bones, extract the marrow and add this to the gravy. Discard the bones. • Mix the flour with 2 cups of water and add this gradually to the meat juices, stirring constantly to mix evenly. Bring back to boil and and cook 15 minutes. • Heat the remaining oil and cook the sliced onion until golden brown. • Add the onions to the Nihari, cover and simmer for 10 minutes on a low heat. • Serve garnished with finely chopped green chillies, ginger and lime juice, accompanied by hot naan breads. Ingredients: Red Chilli, Salt, Paprika, Nigella, Garlic, Dehydrated Onion, Cumin, Bay Leaf, Aniseed, Green Cardamom, Black Pepper, Ginger, Clove, Fennel, Maltodextrin, Hydrolyzed Soy Protein, Cane Sugar, Canola Oil, Silicon Dioxide (anti-caking agent). "Dear Spices of India, I'm glad to have found your shop on the Internet. I can get all the Indian things which I need for my cooking. That's why I have told my friends about the site.You have really very nice SERVICE which is making me too HAPPY. It's also great that the shipping to Germany is reasonably priced. Greetings!"